Background: Leishmaniasis is caused by parasites of the genus Leishmania, and represents a group of chronic diseases with an epidemiological and clinical diversity. The disease is endemic in tropical regions, being found in 98 countries, affecting around 12 million people, with an estimated increase of 1.5 million per year. 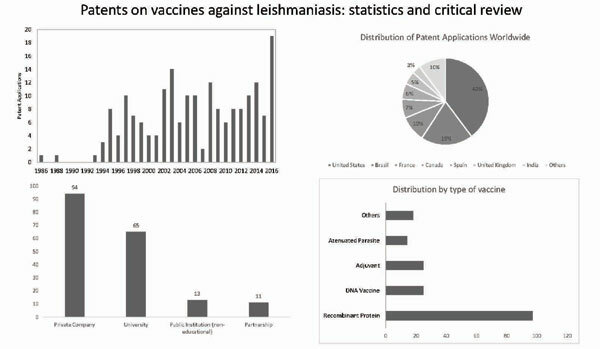 Methods: The present review aims to analyze recent and most important patents regarding development of vaccines to improve immunization against leishmaniasis. For this purpose, the Web of Science – Derwent Innovations Index was consulted. There is also a short description of the licensed vaccines already on the market for commercialization, and a critical opinion on future developments. Results: The data herein presented comprises national and international filings, thus considering the patent's country of origin, and can be used an indicator of a country's technological development regarding a specific field. Several types of vaccines against Leishmania were studied. The main classes comprise: vaccines using live cells (virulent or attenuated); dead cells; containing recombinant protein; using DNA of the parasite. United States (74 patents) leads the ranking of patent applications for vaccines against Leishmania, followed by Brazil (36 patents), which is an endemic region of leishmaniasis with 20,000 human cases of cutaneous leishmaniasis and over 3,000 cases of visceral form. Conclusion: This review showed that there is still a lot of space for development regarding the creation of a feasible, effective vaccine against leishmaniasis. The scientific community appears to be taking steps in the right direction, though. Cutaneous leishmaniasis, innovation, leishmaniasis, patents, vaccine, visceral leishmaniasis.